A week of sneak peeks! First up — we have an exciting SNEAK PEEK that we're so happy to share. Pattern #1025: She Blinded Me with Science Unisex Lab Coat and Safety Goggles for Dolls has been our FREE pattern for mailing list subscribers for a long time. 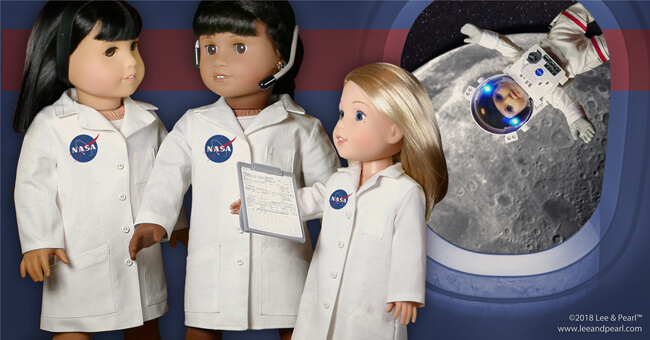 It was such a perfect fit for 2018 American Girl® Girl of the Year Luciana Vega, and for all the STEM goodies produced by the Our Generation and My Life As toy lines, that we wanted it to be available for free to new doll friends for as long as possible. But that time is coming to a close. Pearl has been hard at work this last week, putting together the first muslin prototype of our 2018/2019 FREE pattern for mailing list subscribers  which we are tentatively calling “The Gift” Bow Front Dress for 18 Inch, 16 Inch and 14 1/2 Inch Dolls. We’re going flat out PRETTY with this one  to the extent that Pearl couldn’t bring herself to use ordinary muslin, and splurged on a sweet pink batiste instead. This lovely dress plays off multiple modern trends, including our favorite current trend for soft, graceful self-fabric embellishments. We love this trend, as it makes even large-scale embellishments like the bow-front bodice seem refined and elegant. We hope that you are as excited about this new design as we are. And please tell all your friends to sign up for our mailing list soon, so they can get BOTH Pattern 1025: Unisex Lab Coats now  and this new design as soon as it is available. But that's not all  more fun items will be showing up in our Etsy shop soon! Be on the look out for the return of our perfectly-matched LIGHT, MEDIUM and DARK skin tone stretch mesh, which we will be offering by the yard for use in doll clothes  and people clothes as well! This sturdy, high-quality mesh is perfect for skating and ice dancing dresses, gymnastics leotards, dance outfits, strapless gowns, pageant dress inserts, as well as a wide variety of costumes and cosplay for dolls and humans. Don't worry, we'll let our mailing list members know as soon as this fabric is available again! Who remembers our MYSTERY BAG SALE from three years ago? We had so much fun preparing the packages for that sale  and those packages sold out faster than almost any other items we've offered. Only last year's SILK SALE created similar excitement, thanks to all those luxe, can't-find-these-at-JoAnn materials. Well... our store room is once again BURSTING AT THE SEAMS, and we're going to be doing another Mystery Bag Sale. And for double the excitement, we'll be including lots of amazing luxury, specialty, costume and cosplay fabrics in our bags! Both Lee & Pearl have spent years spotting, claiming and hoarding specialty, costume and cosplay fabrics in the Downtown Los Angeles fabric district — and now we need to clear out some space (so we can buy more). Sparkles, velvets, sheers, metallics, faux leather — and REAL leather — faux fur and trims galore. Hey, if Pearl can find that package of Fosshape and Wonderflex from a visit to a North Hollywood theatrical fabric emporium last year, we might even throw in some thermoplastics! We’re going to be packing generous cuts of these remarkable materials into priority mail padded envelopes — with each padded “mystery bag” available at the same low price. And here’s a special bonus — if you buy more than one, we can pack your mystery purchases in a Priority Mail BOX instead of a bag, and include something from our equally-overflowing craft and prop storeroom as a thank you gift! It's going to be quite the SALE  so STAY TUNED and we'll let you know when we're getting ready to launch!